Following up on the previous post where I asked about your favorite go-to everyday dishes (keep your ideas coming!) I thought I'd introduce some of mine. The posting of them may be sporadic, since I'll be taking pictures and things when I actually made them for dinner. First up is something that is very easy to assemble, quite healthy, cheap, as seasonal as you want it to be, and almost infinately variable. It's simply roasted vegetables. I make this all the time, throughout the year, using whatever vegetables I have. It's a good refrigerator-clearer too. This is not really a recipe, but a sort of generic formula for roasting vegetables. 1 part starchy vegetables, e.g. winter squash or kabocha, sweet or white potatoes, lotus root, other starchy roots. 1 part a combination of aromatic vegetables, e.g. onion, leek, garlic, shallots, fennel bulbs. I don't use ginger for roasting since it turns hard and horrible (though you could use grated ginger). Herbs are a nice addition too. 1 to 2 parts other vegetables. Here you can use anything that is not too watery. Vary this by the season. In spring you might use asparagus or spring cabbage; in summer zucchini other summer squash, eggplants and peppers; in the fall or throughout the year, cauliflower, broccoli, turnips, rutabaga, daikon radish, brussel sprouts...whatever you like. The harder and more solid the vegetable, the smaller and thinner you should cut it. Alternatively, you may want to pre-boil it for a few minutes. Lotus root and taro roots require parboiling, and if you parboil white potatoes, when you roast them they will be nice and crunchy on the outside and fluffy on the inside. For every 4 cups of combined vegetables, add 1 tablespoon of olive oil or other oil, salt and pepper, and mix well. Spread out in a single layer on a baking sheet, and bake/roast for about 15-20 minutes. Take it out and give it a stir around. At this point you can add some toppings - see below for suggestions. Roast for another 5-10 minutes. Cheese! Feta cheese is my favorite for this, but any cheese you like will do. Add at the stirring-up stage. Miso-tahini paste with walnuts (go easy on the salt on the vegetables if you use this) Add at the stirring-up stage. A flowery vegetable combination: Broccoli florets, cauliflower florets, artichoke hearts, tiny potatoes or chunks of regular potato, chopped garlic, rosemary. Toss all with olive oil; top with some gorgonzola cheese. 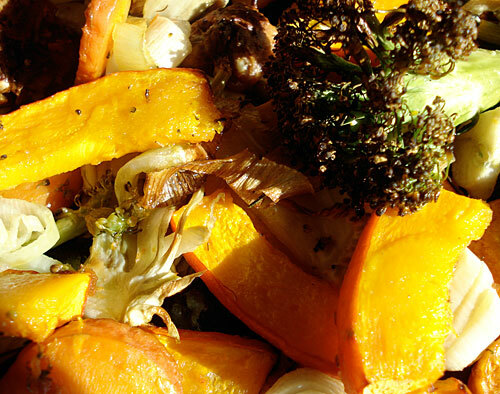 A fall vegetable combination (the one pictured in the photo): Winter squash (kuri squash or Knirps used in the photo), fennel, leek, broccoli, garlic. This can be topped with cheese or Miso-tahini paste with walnuts. A root vegetable combination: carrots, daikon radish, sweet potato, onion, garlic. Toss with olive oil and some red pepper flakes, salt and pepper. Optionally top with feta or other cheese, or go the sweet way and top with some sugar or honey. Submitted by maki on 2008-10-13 16:29. Amazing! Fall must be in the air! I just got finished roasting some vegetables myself this morning. I roasted chunks of turnips, yams, red onions, butternut squash, (kabocha works really well too) and lots of whole garlic cloves. I mix everything up in a big bowl with dried thyme and rosemary leaves, olive oil, and some salt. Roasted it for around 35 minutes at 450f. I love daikon, and it would fun to use it instead of the turnips. Fennel sounds great also! Thanks for the new combo ideas! Can this be stored in freezer or only in a fridge? Love roasted veggies. I add asparagus, celery, brusselsprouts, mushrooms, peppers (all kinds for color), bok choy, Any fresh veg I have in refrigerator. Grape seed oil is good also. Do not use white potatoes as they turn to sugar when eaten. The body needs lots of fiber so don't forget to add fiber to meals. I should make this soon. And by the way, for anyone that enjoys vegetables, I reccomend putting kale in the oven at a low temperature for a few minutes. So good! I can't stop eating my crunchy kale!